Chengdu Panda Base has partnered with many organizations in improving ways to conserve giant pandas. For example, its partnership with Zoo Atlanta helped the zoo secure the loan of 2 giant pandas. To date, these 2 giant pandas, Yang Yang and Lun Lun, have produced five off-spring: Mei Lan in 2006, Xi Lan in 2008, Po born on November 3, 2010 and Mei Lun and Mei Huan in 2013. On April 11, 2013 Chengdu Research Base of Giant Panda Breeding and CNTV reached an agreement on the establishment of iPanda.com after an official signing ceremony, and they immediately started preparing for the test launch (which was estimated in June, 2013). ^ a b "About Chengdu Panda Base". 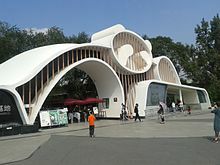 ^ "Giant Panda Base – Chengdu". My »Travel in China« Site. Retrieved 21 March 2019. ^ "Zoo Atlanta's Conservation Education Initiative in China". Archived from the original on 2008-03-17. ^ "New Giant Panda cub born at Zoo Atlanta". Zoo Atlanta. ^ "Zoo Atlanta's Giant Panda Cub Is Named Xi Lan". Zoo Atlanta. December 8, 2008. ^ "2010's only US giant panda cub born in Atlanta zoo". CNN. 2010-11-03. ^ "Zoo Atlanta and Dreamworks Animation Announce Panda Cub's New Name". Zoo Atlanta. February 15, 2011. Archived from the original on 2013-05-23. Retrieved 2011-03-28. ^ "央视网络 "熊猫频道"合作签字仪式在北京举行 - 成都大熊猫繁育研究基地". www.panda.org.cn. Retrieved 2016-10-15. Wikimedia Commons has media related to Chengdu Research Base of Giant Panda Breeding.